Al Haramain, a front-runner in perfumery since 1970, continues to keep its delighted customers around the world satisfied with new fragrances, new experiences, and better ways to shop. 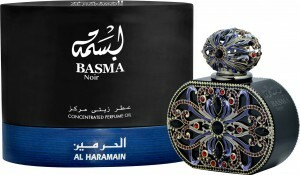 Below are some of the latest additions to our opulent range of fragrances. A jewel that stands out among the rest is hard to ignore, and so are the pleasant-smelling fragrance lovers who use Solitaire. Al Haramain now brings Solitaire spray and the product has already been well received in the UAE and other retail locations around the world. Treat yourself to this outstanding fragrance today. Another top – rated fragrance from Al Haramain: Night Dreams, now offers you more than just perfume, with a gift set loaded with Night Dreams oil, spray, deodorant and body lotion, to take away sleepless nights and relax tensions both within and around you through the medium of its fragrance. This amazing gift set is available for purchase in our stores and also online. Good smiles come to those that wait! 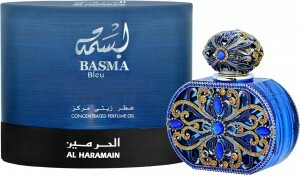 A double surprise from Al Haramain to lovers of premium oriental oils in Basma Bleu and Basma Noir. Bleu is warm and spicy at heart, while Noir warms you up with woody accords, both coming in ornate bottles that carry the weight of importance meant for those that wear them. Both of these perfumes are available for sale in-store as well as online.